One of the best ways of understanding your success is by measuring how happy your customers are. To make sense of their response you obviously need to segment customers. In this post I propose segmenting customers according to the complexity of the products and services that they choose to use. More complex customers typically have a range of relationships with you. In telecommunications this might mean having some mobile phones, land lines and business accounts. In banking this could be deposits, loans, business partnerships and superannuation. For insurance this could include a portfolio of personal and business policies. Even government is part of the picture, with their most complex stakeholders needing a whole range of services which typically span agencies. 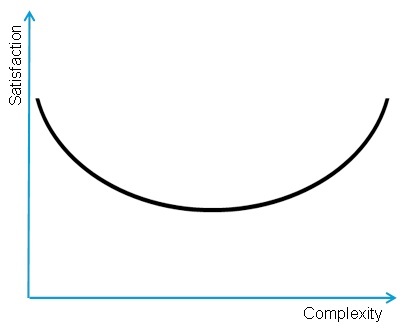 In general, complexity is a good proxy for addressable value. Of course, addressable value does not automatically convert into real revenue given that so many companies compete for the same premium customers. These same customers also tend to be the most adept at negotiating advantageous financial terms. What we find is that the simplest customers, usually those that have just one product or service, are the easiest to satisfy. Particularly with the rise of digital capabilities, they are often able to be provided with a fully integrated approach to managing their needs. Because their needs are simple, they are often the pilot for the latest approach to meeting their needs be it online or through other automated channels, so they can regularly receive disproportionate attention from the web or digital teams. Of course, this simple customer only has a finite addressable value. Worse, because they are entry level into the organisation many have been offered attractive “new customer” pricing which even further erodes their value. Ironically, like the simplest customers, we also find that the most complex customers are usually pretty satisfied with the service that they are offered. These premium customers are seen as having the capacity to provide a substantial return. They are worth investing in, and generally know it, so demand a high degree of servicing. This high touch means that any complexity in the organisation and across the products that they hold is handled on their behalf. With such support, it is little wonder that they are well satisfied. It is also worth noting that their satisfaction is also largely guaranteed by the fact that these highly capable customers won’t hesitate to leave when they are dissatisfied. As a result, those that are left are generally remaining for a reason. It is the middle group who can be most interesting. They have enough complexity in their product set that they miss out on the simplicity of service that the first group benefit from. They don’t, however, have enough complexity or value to warrant the high touch of the most complex customers. They are truly stuck in the middle. This middle group of customers are often the ones who are most dissatisfied with the service that they receive. Because of their numbers and the range of products that they could have, there are too many permutations to provide a simple intuitive digital pathway. Often their products span organisational boundaries (both their own and yours). Dealing effectively with the middle really means finding a way to service them systematically, ideally through digital channels. The middle gains the most from any simplification and can be the most rewarding because everyone struggles with providing them with consistent, quality service at an affordable price. The key to their satisfaction is providing consistent, understandable information and access to their portfolio across digital, call centre, in person and third-party channels. Although the middle requires more servicing than your most simple customers, they are usually much more profitable and there is the opportunity for there to be more of them of them than there will ever be of your premium customers. In addition, the middle ground is often less fought over and so more profitable. From the customer’s perspective there is enough complexity for you to offer differentiated value and inadequate competition for them to feel that they are being meaningfully wooed by your competitors. Standing in the way of harnessing the middle is the complexity of the organisation. Providing quality service is often hampered by internal organisational boundaries, overly simplistic assumptions around master data and the number of legacy products and systems (see my previous post: Value of decommissioning legacy systems). For instance, it might make perfect sense to the company to differentiate between the services provided to business and personal customers. To the customer, this distinction is frustrating when they are using products and services sponsored by a business (either their own or their employer) in combination with their own direct relationship. Ultimately this is a master data problem with too much reliance being placed on the financial accountability and not enough on the user. In most industries, there is the opportunity to differentiate your service to this group by making it incredibly easy for them to manage their products and services with you. To do this, don’t try to have all of the answers. Use crowdsourcing find answers to individual questions and even design new solutions. Most importantly analyse the results to improve the services that the company provides or even hand them off to third parties. In the future, servicing this large number of customers may look more like an “App Store” with solutions from others that you have sanctioned. You may even provide a budget for customers to download from this “App Store” letting them drive a much more agile set of solutions than you could ever hope to design let alone develop. Your customer of the future might be referred to a particular product through a social network. Even after looking at an overview on a website and exploring it in context using augmented reality (using a digital device to combine visual and location with external information such as real estate value, insurance premiums or network coverage) the potential customer might still need to talk to someone. The call centre and the potential customer would both have the full suite of information in front of them at the same time and, if useful, live streaming from the digital device allowing the call centre operator to close the transaction with the minimum of fuss. As additional information comes to hand, before or after completing the transaction, it will be easy to add it to the portfolio even if it changes details such as the customer’s employer or the basis on which the product or service is being paid for. Seamless integration is the key to satisfying the middle group of customers. Such integration is needed by the backend systems (by communicating using a lingua franca), the information layer (all channels need to be able to access the same information in real time) and the front-end (digital, call centres and third-parties servicing customers either on your behalf or in partnership with you). Achieving this vision is a journey of steps. The first step requires you to review the use of master data to determine if it is structurally rich enough to describe how your customers want to navigate their products and services. The second step is to review how well your digital channels leverage this master data strategy. Ensure it is codified in a way that means that future changes to your master data (including the addition of new products and services) and navigational needs (such as bridging social networks, employers and other relationships) will naturally flow through to the experience that your customers will have. Finally consider opening the door to collaborating with others to provide the best possible service to your customers. Collaboration might bring together different business units, other customers, third parties acting on your behalf, and joint venture partnerships.